it is only on the grade-point-average, the business people in Frankfurt’s city centre could be satisfied. With the stars 2.2 the 2000 passers – by, who were interviewed on behalf of the Frankfurt chamber of industry and Commerce (IHK) and the city of the major shopping streets in the city have a rating of the attractiveness of Frankfurt. This is even slightly better than in the previous survey four years earlier, at the time, the average grade of 2.5 was. Bad been evaluated, however, as in previous years, cleanliness and safety in the city, as well as the amount of the Parking fees. To improve the overall result for the first time, asked questions to offer the gastronomy and to events in the city centre have contributed, according to the chamber of Commerce and industry. 77 percent of respondents stated that events such as city festivals and the Museum embankment can be fixed for you a reason to travel more often in the city centre. Every third person travels to the coffee to drink or a visit to the Restaurant. Entertainment and adventure played today, next to the shopping an increasingly important role, made Alexander Theiss, chamber of Commerce and industry-managing Director for marketing, yesterday at the presentation of the Figures. These opportunities, it is important to make better use of, said Joachim Stoll, Chairman of the retail Committee of the chamber of Commerce and industry Frankfurt. All the more so as the survey, according to him, also shows that more and more customers are shopping online. Was four years ago, yet every second Passer-by to order anything on the Internet, so it is now only every fifth. This does not mean, however, that the respondents, a third of whom are from the surrounding area came, basically in the city. On the contrary, Nearly three times as many customers that shop online, reported in the current survey to get more shopping in the city centre. Is bought but less. “The frequency is the same, but the average ticket as well as go down,” said Theiss. After all, every Euro can be spent only once. “We will have to work very hard, so that the downtown remains attractive,” said Stoll, even if Frankfurt stand in comparison to other major cities. An increase in the Parking charges and driving bans for older Diesel are in the view of the chamber of Commerce and industry the wrong Signal. 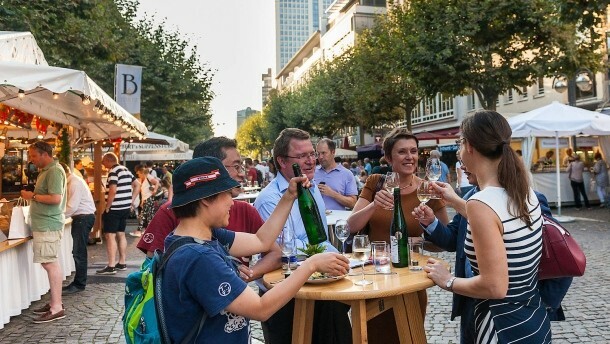 The number of downtown visitors who drive by car to Frankfurt, is increased according to the latest survey, from 24 to 32 percent, while in 2014, only 48 instead of 66 per cent, with Bus and rail travel. The chamber of Commerce and industry has called for a better public transport system. To include an attractive center of trade experts, the restoration of Hauptwache and Konstablerwache, just a continuous, free W-Lan network from the point of view of the chamber of industry and Commerce everywhere in the city. For Thomas Feda, head of the city tourism and Congress GmbH, it is important that the flows of visitors, in Frankfurt, the increase according to his estimates, in the future, be better directed. A digital note and wayfinding system in the downtown was helpful.